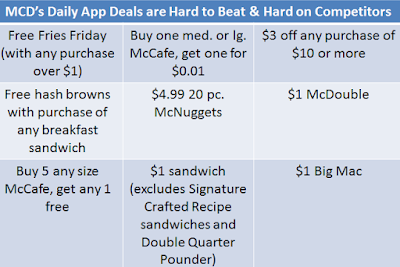 Word is that MCD is doubling down on discounting. OPNAD are just order takers any more. Food cost will go up and cash flow will go down. Top line sales should go up and drive the stock price up with it. With all of this going on they are not pulling anything back on reinvestments. It will be a bumpy and costly ride. Thanks, NLC & OPNAD for representing the franchisees guess you forgot you were elected to represent our interests. It has become the $1 dinner in a $3 million restaurant build out. I can't imagine once interest rates continue to rise, the economy slows down and sales are not strong there will be some big-time operators not able to manage their debt. The above Comments are spot on. NLC & OPNAD have not represented our interests in a long while. 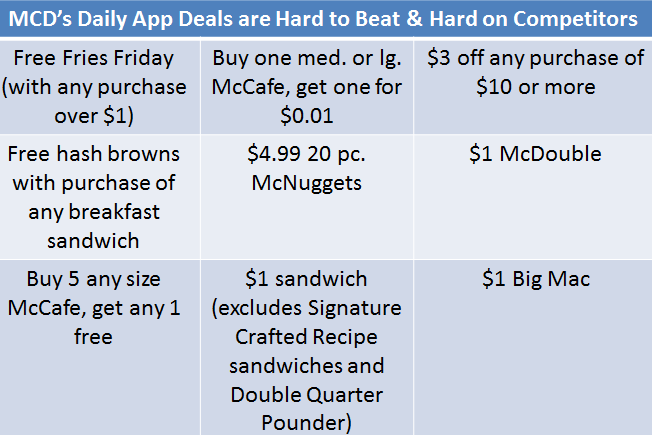 The OPNAD Plan is not working so now is the time for More DEEP discounting they say, $1 McDouble & $1 Coffee. Instead of Blaming the flawed assumptions that McD marketing knows BEST, McD will blame the Operators. Even though I am have an Excellent year in Sales & CF. Operators that are doing the required reinvestments with 100% debt are crossing a very slippery slope, for sure. With discounting becoming the prefered marketing policy cash flow will clearly take a hit and that will impact the ability to service this new debt. The banks are approved to offer interest only the first year with no prepayment penalty on the principle in later years. It's a good deal but it spotlights the company understanding of what is going to happen to operator cash flow. Operators will have less money to pay bills. Operators should eliminate as many controllable cost as possible and do it now. Operators are constantly being asked to make up for a failed plan. We all knew at the Gallery Walk that the assumptions were fantasy. Now the children that run this company have found out that business is different from textbook theory and they are in a panic. We constantly do things that push our customers away from us and the company minions are surprised by the results, It has been said may times that we want the family business but we stop building play places, Fire Ronald & tell parents that we know better than you what your child should be eating and then act surprised when families have had enough. We want to save the world & eliminate one of the main reasons customers bought our Sweet Tea the foam cup and straw next. Maybe we should have waited on some of these do good ideas until after we changed the trajectory of the business. Now we go back to the old playbook and bring back the $1 McDouble, further eroding the profits that are supposed to pay for overpriced lobbies, dysfunctional kiosks that we force our customers to use and technology that is an embarrassment. Stealing from Peter to pay Paul. Unfortunately our operator leadership doesn’t have the intestinal fortitude to actuall ever say “No”. The company continues to bully us with “The Letter” and we fold. Chris like a petulant child needs to learn the meaning of the word no. “None of Us is as Good as All of Us.” Poor Ray. The Comment above gets a HIGH 5 from me. "We want to save the world & eliminate one of the main reasons customers bought our Sweet Tea the foam cup and straw next. Maybe we should have waited on some of these do good ideas until after we changed the trajectory of the business." Keep in mind that the children who run this company are all politically liberal. As liberals, the most important thing in their lives is the approval of other liberals. They will continue to put the liberal agenda ahead of the best interests of McDonald's. It's the perfect job for a liberal - playing around with other people's (Operator's) money.